HARRY Kane has been appointed captain of England, possibly the nearest the nation will get to a “Roy of the Rovers” figure leading the team into battle. Kane has already delivered the kind of message the hordes will want to hear from the man with the armband, “England can win the World Cup.” Even the most myopic England fan will chuckle at this, but Kane, an honest broker and fundamentally decent, hard-working chap, will have the backing of the white-shirted masses, regardless of the badge-kissing nature of his first tonic for the troops. Walking along Olympic Way on FA Cup final day, Bryan Robson was spotted ascending the ramp, relaxed, casually-dressed and trying to appear anonymous. “One Bryan Robson, there’s only one Bryan Robson”, demonstrating that England skippers are still revered figures. They certainly carry the country’s hopes on their shoulders, often to the detriment of their own well being. In Robson’s case, he was certainly a talismanic figure, strong, responsible, determined, but sadly, injury prone. 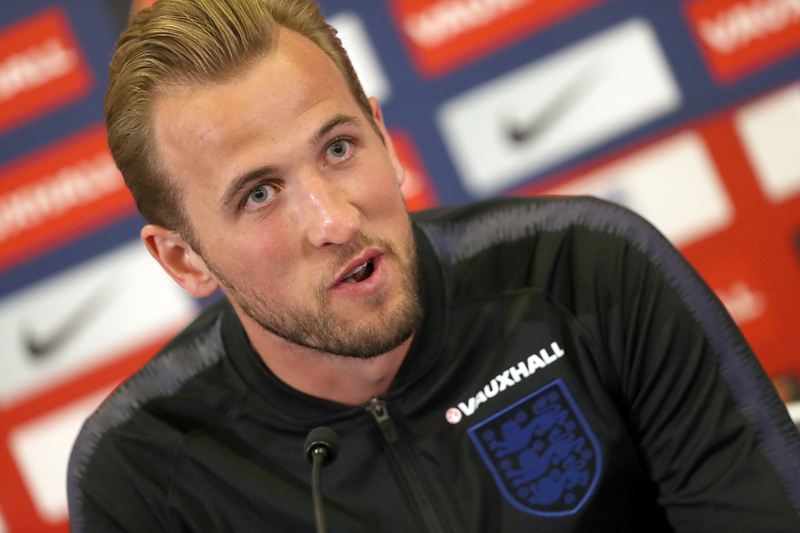 Kane has the look of a pre-WW2 centre forward, an air of “John Bull” about him. To some people such a figure is somehow representative of the rather confusing age we live in, the Brexit era. “One of our own,” they proudly sing. At the FA Cup final, indeed at both finals since June 2016, it is no coincidence the national anthem has been sung with greater fervour than ever before. People were actually singing the words. Not unconnected, anyone attending a final at Wembley will be aware that in recent years, there has been a notable representation from the armed forces, the Football Association appears to have an unhealthy fascination with all things military. Of course, historically, the services have used the mass gathering of people to remind everyone that Britain has an army, navy and air force. This year, though, with the RAF celebrating an important anniversary, Wembley was awash with blue and there was even a fly-past as the teams walked out. With the sea of air force colours, the jets and the very irritating pyrotechnics, any onlooker would be forgiven for thinking Britain had become a military state. This atmosphere of slight jingoism, at any other time, would just be seen as a rightful nod in the direction of people who serve the nation, but in these days of Brexit and revived suspicion of “the foreigner”, they add fuel to the debate that Britain has changed in the two years since canvassing began to turf the United Kingdom out of the European Union. It is amusing, however, that some football fans who have supported the Premier League and rejoiced at the rise of their favourite clubs, teams that are able to sign the crème de la crème of world football, should also be at the front of the queue in rejecting the EU. Football has always been the platform for nationalism, often the excuse to confront the foreigner. The cries of “two world wars and one world cup” have only just subsided some 50 years after England’s triumph in 1966. Perhaps this was because the performances of the England national team have been so tepid that wallowing in sepia was becoming a little embarrassing. Or maybe it was that we have grown to respect Germany for what it is today rather than what is was in 1939. British people, like England’s football clubs, have cherry-picked Europe for the things they find appealing. We like France for its wine, food and bread, but we don’t necessarily warm to the French themselves. We covet Italian style, fashion and cuisine. We buy German for its reliability, high-tech and quality. And now, we think we can “buy” Scandi hygge, which is not a commodity but a frame of mind. In short, over the past 40 years, we have realised that Europe has many things that can make Britain a more cosmopolitan and liberally-thinking place. It has taken a long time, for since 1973, the deluded belief that Britain was “great” was founded on imperialism, arrogance and the medals received from two world wars (and one World Cup). Not even defeats by USA (1950) and Hungary (1953) were allowed to fester for too long – England was still the cradle of the game, even though as pan-European competition began in the mid-1950s, English clubs were overshadowed by Real Madrid, Benfica and the Milan duo. From a football perspective, there is a sense of irony about the fact that since joining the old Common Market, the England football team has been in decline, which probably has as much relevance as the Labour party’s claims that England only win the World Cup under a Labour government. In fact, the fall of English domestic football can be traced back to the same era, when crowds started to drop until the mid-1980s when they bottomed-out. The creation of the Premier League saved English league football, but its rise and growth to the exalted status of today is partly attributable to the opening of borders, the very borders that may change when Britain leaves the EU. In 1991-92, the last season of the old Football League, Leeds United’s title-winning team comprised only one player that did not hold a UK/Irish passport – Eric Cantona. A few years on, Manchester United, who now had Cantona in their ranks, had three (Schmeichel and Kanchelskis were the others). In 1994-95, according to Harvard University’s Laurie Shaw, only 8% of players in the UK were from other EU/EEA countries. By 1997-98 – with Arsenal and Chelsea now employing foreign managers – that figure had risen to 24%. The catalyst for this rise was the passing of the European Court of Justice Judgement of December 1995 – the so-called Bosman ruling. Prior to Bosman, English clubs could only field three foreign players, but after that landmark ruling, clubs like Arsenal and Chelsea went berserk. The overwhelming concentration on foreign talent brought some marvellous football to the Premier League, but somewhere down the line, people forgot about the England team. Misguidedly, somebody decided that England had, after all, a “golden generation”, but most of the hubris was founded on the equation high quality wages = high quality players. Their under-achievement was no surprise, the England lads may just have looked good every Saturday or Sunday because they were playing with outstanding foreign players. Left to their own devices, many were like Lennon without McCartney (or Clough without Taylor). Furthermore, the real heroes that emerged in the Premier League’s first flush were the likes of Cantona, Zola, Bergkamp, Ginola and Henry. These were the players that made the competition the global, multi-cultural and glamorous competition it became. In the 1980s, Britain eyed Italy’s Serie A as the ideal competition, but after the turn of the century, the Premier grew into a heavily-marketed, cash-rich and attractive proposition for the world’s best players. While this was in process, England’s own fortunes were in freefall, partly because of a lack of investment in young players. On the face of it, England’s performance in the 12 major competitions since the Premier was born is little different than the 12 that preceded it, but there is an important factor to consider – that competitions are bigger (and therefore have more spaces) and it is often more difficult not to qualify. In the 12 competitions going back to 1970, England failed to make the cut four times, reached three quarter-finals and one semi (1990). Since 1994, England have failed to qualify twice (1994 and 2008), reached one semi-final (1996) and four quarter-finals. Compare that to Germany’s record since 1970 of six titles, six runners-up, six semis and two quarter-finals, and England’s record looks fairly abysmal. Most telling, there is a disturbing trend of under-achievement and elimination at the hands of teams that would, in the past, have been comfortable opponents. Going back to the 1970s, 1980s and 1990s, England would succumb to the likes of West Germany, Argentina, Portugal and Italy. No disgrace in losing to any of those teams. The default position for England was last eight, but in 2014 and 2016, England failed to get that far. Indeed, a group exit in the 2014 World Cup seemed to be the lowest point when a 0-0 draw with Costa Rica was greeted with some mild relief. But in the Euros in 2016, capitulating to Iceland merely confirmed that England’s status had certainly deteriorated. After such poor displays, more people started to subscribe to the theory that the Premier, with its international line-ups, had inflicted harm upon the national team. This may be true, but it is not the fault of the employees, it is a lack of understanding that domestic football has a role in nurturing talent for the future of the national team. But which national team? For example, Belgium’s preliminary squad for Russia has 13 Premier-domiciled players. England’s top clubs are no longer owned by local people – consider that of the elite, Arsenal, Chelsea, Liverpool, Manchester City, Manchester United and Tottenham, only the last one has UK ownership. It’s almost certainly not a deliberate strategy of exclusion of talent, but the country’s big clubs, like many corporates, no longer belong to the nation, but are global brands. Instant gratification and the burning desire for annual success override any obligation to feed the England team. That’s not to say that these clubs do not invest in youth football, because some have outstanding academies and [multi-cultural] youth teams, but their players do not filter through to the Premier League, many are sold as part of a commitment to player trading. It was something of a surprise when England manager Gareth Southgate called-up Chelsea youth products, who have yet to forge a Premier career, into his squad. He was clearly making a point. Southgate’s squad, although showing signs of promise, has a developing under-21 look about it, which implies that success in 2018 has already been discounted in the corridors of power. Interestingly, England is the leading destination for players from most leading European countries, with France, Spain and Portugal very prominent. Unsurprisingly, England has one of the lowest percentages of club-trained players at just 14.1% and over the past three seasons, only 7.16% of Premier appearances have been made by these players (source: CIES). Equally revealing is that the average age in England’s top division is 27.35 which places it near the top across Europe. Put simply, English clubs buy maturity at the expense of their home-grown youngsters. With Brexit, demographics will surely change. Laurie Shaw’s research suggests that if the rules concerning work permits had applied over the past 25 years, just over 40% of EU/EEA players joining Premier League clubs would be allowed to play football in the UK. That’s a dramatic figure. Players like Anelka, Fàbregas, Kanté and Mahrez would not have come to England. Basically, after Brexit, EU players will have to get in the queue along with players from non-EU states. Clubs at the top of the list will not suffer too much, because they buy experience, but the acquisition of young players will surely dry-up as they will fail to meet the criteria required to obtain a work permit. This will impact clubs lower down the food chain who cannot afford experienced and expensive international players, which in turn will continue the polarisation trend. English football will, like society, change as a result of Brexit. Importantly, it is not a time for isolationism or increased xenophobia, two qualities that appear to have come to the fore in certain segments of the country since June 2016. The creation of the Premier League and its subsequent globalisation was, in part, a reaction to an insular football nation that was crumbling and welded to an out-of-date model. It has its faults, as indeed the European Union has its negatives, but Britain and British football have benefitted from the introduction of fresh thinking and innovation that has come from freedom of movement. It would be a shame if we had not learnt from that, but equally, it would be foolhardy to assume that the current structure does not need reassessment. Perhaps British talent on the field, on the training pitch and in the managers office can be allowed to flourish once we finally do leave the EU fully. At the moment that could still be years away, if ever. Your view of history, the benefits of player saturation from continental Europe and a future with less of them is all a bit one eyed, overly fretful and devoid of the potential benefits. I suspect that it will result in more emphasis on development of talent, but not necessarily among the very top clubs – I still think the desire for instant success will override patient player nurturing. As for history, I witnessed much of the decline of British football, so my view is based on some experience. However, I don’t necessarily believe the Premier as it stands is a good thing for the broader game. Thanks for your feedback. Purity Laws which protects its own brewing industry. attributable one way or another to the EU. and certainly entrenched without any lip service too “muddling through” as ever. will evolve IF it reconnects as The Game Of The People. Hope we don’t get too political, though to some extent inevitable.